Samite Mulondo has touched hearts and souls since he came to the United States as a Ugandan refugee in 1987. In his earlier career he was a vocalist first and an instrumentalist second. These days he largely reverses that formula. Samite still has a voice that's like buttery caramel, but he has also mastered various types of flutes, the kalimba, hand percussion, and the litungu, a handheld harp that looks as if it's crossed with a banjo and a kora. 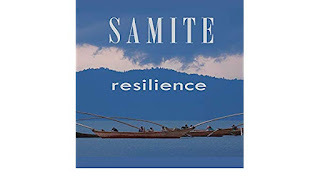 Samite's latest album is titled Resilience. It is the soundtrack to a one-man show he has launched in which he tells his personal story as a way of advancing the organization he founded with his late wife: Musicians for World Harmony. He believes that music is a balm for a troubled world filled with war, poverty, and preventable diseases such as AIDS, hence he devotes much of his time to working with school groups and building community. All of this is deeply admirable, but for now the central question is how the project stands up musically. That question is a bit tricky and often depends on how you feel about the overall vibe of Samite's current sound. It is a blend of World Beat, folk, Afro pop, and New Age. The latter is a problematic term. It is generally viewed as easy listening that's a relaxing sound that's not quite pop and not quite light jazz. At its best, new Age is soothing and meditative; at its worst, critics trash it as California-style elevator music. No fear of the latter from Samite, but the new album is far more interesting when it is at its most African in feel. The title track, for instance, opens with Samite playing a resonant metal flute. The melody invokes mystical Celtic New Age until Samite begins to sing, accompanied by looped vocals. In other words, this track is a musical hybrid. The same is true of the 7-minute "The Search," which is quiet and contemplative. Both are lovely tracks, but I prefer the pastoral feel of "Mayengo," which is cut from similar cloth, but is bolstered by ringing flute notes and African-style guitar rhythms. Samite switches to the litungu on "Waterfall." It provides us with cascading notes, but he uses a heavy thumb to provide a thrum that frames his voice and makes the composition flow. "In the Moment" is in the same vein. In each case, the composition could be labeled New Age, but the guitars render problematic such a designation. "Space" sounds as if it must be New Age, but Samite's skillful use of the flute—including chopped notes in the transitions—takes us to new places. Ditto the use of the litungu on "In the Moment." "Ntinda" employs a cappella call-and-response vocal that cuts away to joyous guitar and flute. Ultimately, though, resilience is indeed the album's theme. Samite challenges us to remember that change often comes through quiet determination—the velvet glove, not the iron fist. Why Marbury v Madison is a BFD!